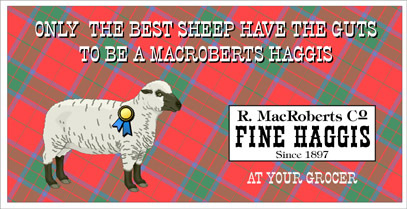 This billboard is a companion piece to the decal set on the Haggis Decal Project web site, to further beat the joke (explained on the aforementioned site) into the ground..
..and if you think that this billboard is a little gross, you should have seen the one I drew up which had a photo of a haggis on it-- 'tweren't pretty, believe me. Each of the three files below contains the artwork for one billboard. All original contents of this Web site are Copyright © 2002, John F. ("Fritz") Milhaupt, All Rights Reserved.